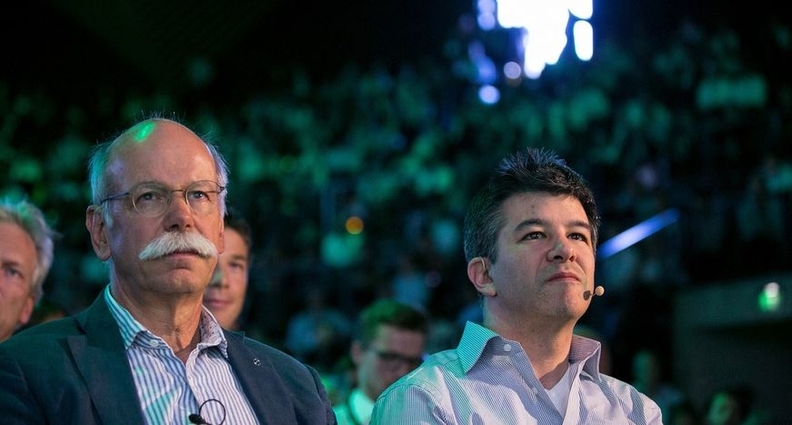 Daimler CEO Zetsche said he had met Uber CEO Travis Kalanick several times and described him as a "frenemy." BERLIN -- A promised showdown between the CEOs of Daimler and ride-sharing firm Uber, Silicon Valley's most valuable private company, turned into more of a wary courtship when the two met publicly on Wednesday. Daimler CEO Dieter Zetsche and Uber's Travis Kalanick were interviewed together on stage at Axel Springer NOAH, a two-day conference in Berlin of venture capitalists and technology companies. "Cars are not going away soon and companies like Uber are not going to be making them," Uber's Kalanick said. Zetsche said he had met Kalanick several times and described him as a "frenemy," which he defined as a combination of friend and enemy, before joking that "we call that marriage in German." Turning more serious, the Daimler executive said: "We are competitors, of course. There might be many areas where we are competitors in the future," but added they were also friends. With this month's announcement of a $3.5 billion investment in Uber by a Saudi Arabian sovereign wealth fund and a partnership deal with automaker Toyota Motor Corp. which also included an investment stake for an undisclosed amount, Uber's private market valuation has soared. At $62.5 billion, the car-sharing firm is now potentially worth more than the stock market capitalizations of automakers BMW, General Motors and Honda and close to those of VW, Daimler and Ford. Toyota, the world's most valuable automaker, is worth around $172 billion at current stock prices. When asked whether Daimler would consider taking a stake in Uber, Zetsche said his company only makes strategic investments it controls, while Kalanick said he would not be interested in Daimler taking a "dominant" position in Uber. In one of the testier moments, Zetsche asked Kalanick to justify how Uber was worth roughly as much as Daimler's $70 billion stock market capitalization, despite being a seven-year old company that has never produced a profit. Kalanick repeated recent comments that Uber is profitable in at least 200 cities it operates in, but is investing heavily in markets like China: "In the developed markets we are profitable, in the developing markets, we are massively unprofitable." An on-stage interviewer asked him whether his investors ever ask him when he plans to become profitable. Kalanick acknowledged that, yes, "sometimes investors ask." Kalanick, who earlier this year in a TV interview ruled out seeking a public stock market listing for his company this year, reiterated that "we are going to IPO as late as possible." The moderator demanded to know how many years before Uber would hold an initial public offering. Kalanick replied: "It is going to be somewhere between one year and 10," appearing to reopen the door to a possible IPO as early as next year. Travis denied this, saying: "I have not signed a $10 billion check to buy 100,000 S classes" referring to Daimler's flagship car model. Zetsche quickly followed by saying, "No, I can't" confirm the report that Uber was considering the massive order. Asked about his ongoing legal battles with local regulators in Germany, Kalanick said he often reminds European regulators when he meets with them that the same legal issues came up previously in the United States and were eventually settled. A state court in Germany ruled Uber's alternative taxi service using non-professional drivers illegal last year. "I am very patient here in Germany," Travis said. "I have got to get a couple of those cars on the system," Kalanick said of the idea of supplying Trabis to Uber drivers to transport local passengers.